With a splash of imminent danger and a sprinkle of breathtaking intrigue, it’s time to mix up an exciting new Atelier adventure! We are returning to Arland this stint to spend time with the Helmold family and friends. 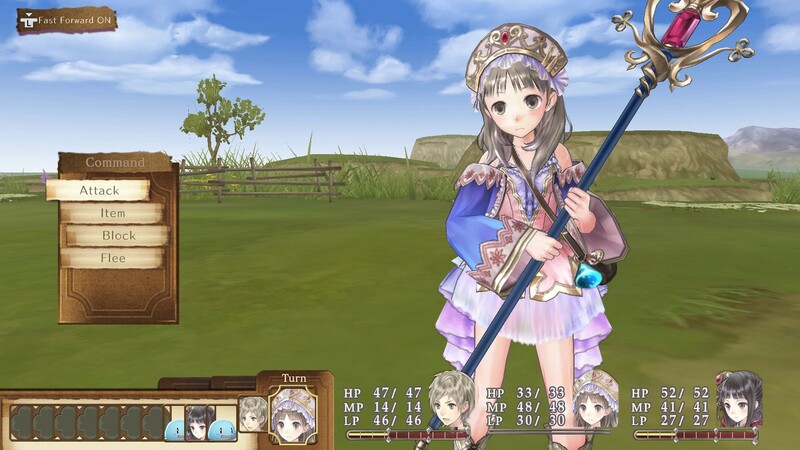 Atelier Totori: The Adventurer of Arland is the second of the Ateliers in the Arland series. 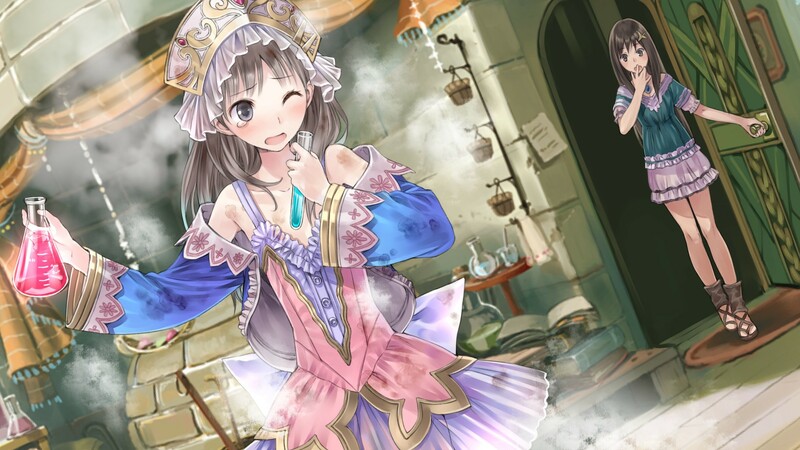 While it shares some of the same cast of characters with its predecessor Atelier Rorona: The Alchemist of Arland, the gameplay and user interface is quite a bit different. 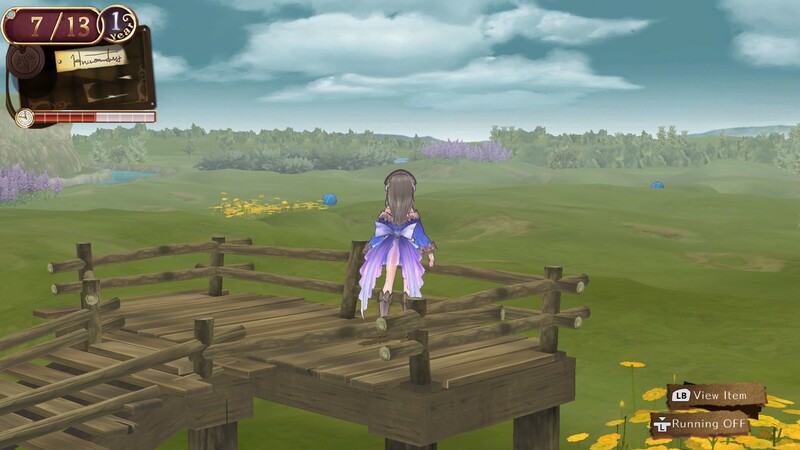 Unlike Atelier Rorona, the gameplay and map interaction in Atelier Totori is more akin to Atelier Sophie: The Alchemist of the Mysterious Book. That makes sense because Atelier Totori is newer than Atelier Rorona. With each game building on the foundation the other left behind, it makes sense that the closer the games are in time of development the more similar they will be at the core level. Without further ado, on to the review. I have to say it is hard to do a game justice when you are faced with a tight deadline, and when that game itself involves its own tight deadlines it can definitely be a challenge. Thankfully, Atelier Totori does away with the three-month turnaround time that poor Rorona had to face and instead replaces it with a rather long three-year period (technically five-year, surprise!). With Atelier Rorona, the timed quest system more or less held your hand and told you what you had to do in order not to fail the game. Anything else you managed to do was considered a bonus. 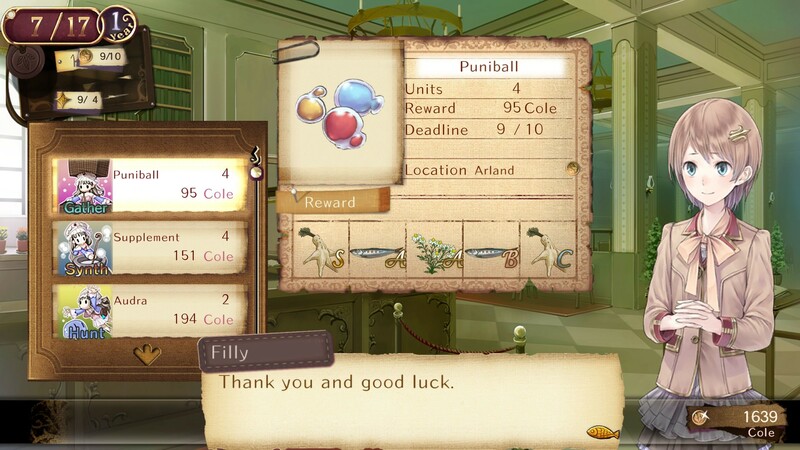 With Atelier Totori, you just have to do a bunch of random stuff until your three-year time period is up. If you did enough random stuff, then odds are your license will get renewed and you will get to keep playing and doing more random stuff until it needs to be renewed again. You also have to check in to the Adventurer’s guild periodically to rank up your Adventurer Class so you can visit more areas, but that too is at your own pace. After having just played Atelier Rorona, I have to say this lack of focus was a bit jarring. With Atelier Rorona, you always knew what you had to do next to progress, but Atelier Totori you can pretty much do anything you want any time you want. There are a few events based on the calendar but outside of those, anything goes. Adventuring, as the title implies, or rather expressly states, is what Totori’s life is all about. Going to new areas, finding new things to craft with, new monsters to fight and new sights to see is what it is all about. She does have another motivation besides just advancing her alchemy skills and seeing the world, she is trying to track down a fellow adventurer who went missing a couple of years earlier. That famous or more aptly stated infamous adventurer happens to be… her mother. Moving away from that topic to avoid spoilers I have to mention that the politics in this game are interesting. In Atelier Rorona, they were governed by a King who himself had a thirst for adventure. After the King ran off on an adventure of his own, sometime after Atelier Rorona concluded, the government changed. New laws were passed and new rules were ordered to be followed. One of the new rules is that if you are not a licensed Adventurer, you are not allowed to stray too far from the relative safety of your hometown. Luckily enough, Adventurer licenses are not hard to get, but they are hard to maintain with a stiff penalty of “Either become a successful adventurer or be banned for life from adventuring if you fail even once.”. As your Adventure Rank advances, your ability to explore the world becomes less restricted. It’s more or less a creative way to keep you confined in the early game to prevent you from progressing too far too soon. Without a system like that in place, I’m pretty sure I would have run to the evilest dungeon available, looted anything I could then ran out of there screaming with all my plundered goodies within the first in-game day. I digress, the system makes sense, and it does give you a bit of focus in a game that otherwise leaves you to your own devices. The Job Request system will give you random quests that you can do if you are at a loss for what to do, but other than getting the money and materials they are more of a side gig this time. Reputation grinds are not a thing in Atelier Totori like they were in Atelier Rorona. That’s not saying you shouldn’t still do them, they are great especially if you were going to make the item or visit that area anyway, but other than unlocking a few events the requests system is far more muted in this game. The core gameplay is very similar to Atelier Rorona or really any other Atelier game. In each of the zones you visit there are materials to harvest, and while some zones lack monsters, most do not. Once you fill your basket up with various sundries you can head back to your workshop to begin construction on the various things you want to make. Alchemy is exactly as it was in Atelier Rorona, simply selecting the items you want as per the recipe is all that it takes to make the item. There are no grids, shapes, sizes or colors to match here, just plain and simple items. It’s not quite that simple, but it is still way more simple than future Atelier titles. Item quality and attributes are something you will need to pay attention to if you want to have items of quality and value to you. For example, making a bar of metal with various elemental attributes is a great idea if you intend to turn that bar of metal into a weapon. That way your attack will not only do the base damage, but also various elemental damages on top of it. 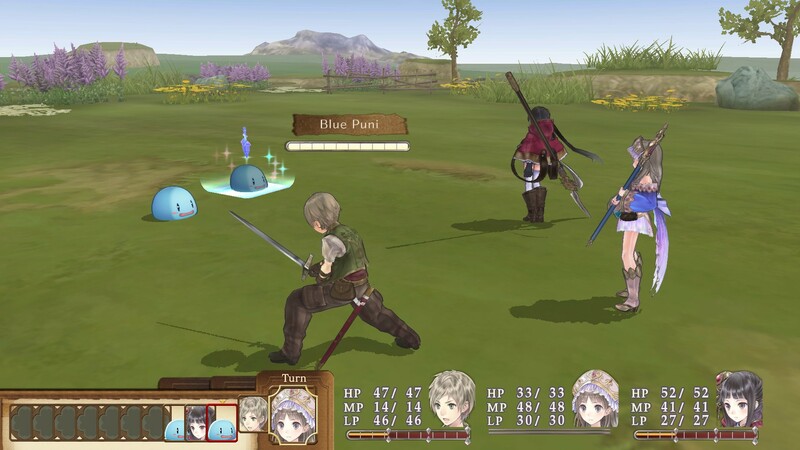 Combat in this game is more streamlined than Atelier Rorona as well. While the fancy combo chains available in Atelier Rorona seem to be absent in Atelier Totori, the combat is much more straight forward. 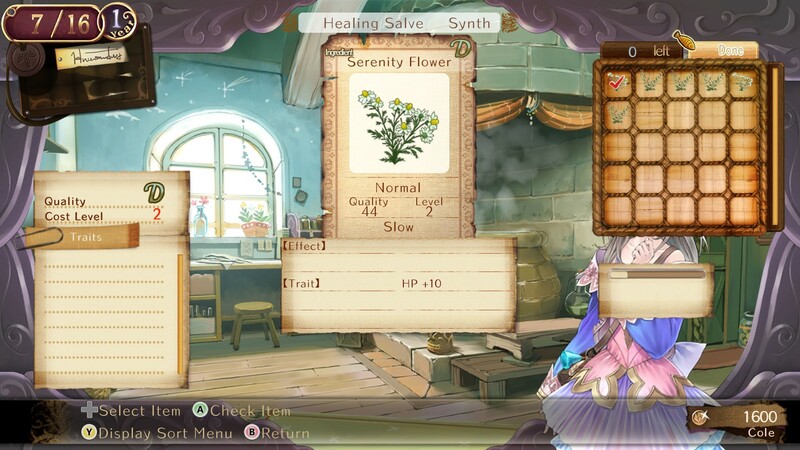 The limitation that only Alchemists can use items remains in Atelier Totori, but generally that is okay. Totori herself is generally much more of a weakling than Rorona was in her game so you will likely find yourself using items far more in Atelier Totori than you may have in Atelier Rorona. Luckily Totori has a skill that allows her to use an item without actually using it up, with the trade-off being a reduction to the combat effectiveness. Combat is still turn-based, with the turn order is displayed at the bottom of the screen this time. Paying attention and being strategic in your combat targets can really turn the tide of battle. Some enemies cheat a bit and get two or three turns in a row so that is something you must learn to watch for when selecting your targets. Each of your possible companion characters have their own fairly unique options when it comes to combat. It can actually be quite hard to choose who you want to bring with you on any given outing. The included former DLC characters are nice as well, but they can mess with your ability to get the true ending of the game if you are not using the core characters enough or at the right time to trigger their events. It’s time to talk more about time. As mentioned, in Atelier Rorona you were rushed through the game a bit due to having to meet goals on a strict schedule. Atelier Totori’s schedule is much more relaxed, allowing you to enjoy the game more without having to worry so much about wasting precious time. That isn’t to say you have all the time in the world, but you do have sufficient time to stop and smell the flowers. Speaking of which, unlike in Rorona, gathering materials or getting in fights now uses time too. In Atelier Rorona, time was spent when you moved between areas on the map, subfloors/levels in an area, slept or performed alchemy. Doing anything else basically left the timer frozen. In Atelier Totori, time is used moving between points on the map, getting in fights, picking materials, alchemizing and sleeping. For the most part, the areas on the map do not have subfloors/levels this time around, or else maybe Totori is not very inquisitive and just turns back after visiting the first area. Time is divided into segments, and each action you take uses a certain amount of the gauge. You can make special items that help reduce the time required, but the time will still advance a bit. This means you may have to peek at the items and see if there is anything worth spending time picking up or if you should just ignore that particular gathering point. Looking at your gauge will tell you how close you are to advancing the day. If you only have a sliver left perhaps you shouldn’t pick any more materials up or get into any more fights. You should probably just leave, otherwise you might end up using an extra day, as leaving the area will automatically finish off whatever is left in the gauge. Similar to Atelier Rorona, much of Atelier Totori is voiced. If the content of the message is even slightly important to the story, the game generally has it spoken aloud to you. If it is just minor details or a bit of information or side story, it might just be plain text. This works quite well in this game and makes you know that you should probably pay more attention when the characters actually start to speak again. The background music is lovely and the opening and closing music is quite nice as well. The voice lines in combat get repeated way too much but there isn’t a lot one can do about that. It’s either having them say something or have them just stand there, so I guess having them repeat the same thing yet again is better than nothing. The characters in this game are the same unique and fun bunch of characters you would typically find in an Atelier game. Some of them are new, some are from Atelier Rorona or other Atelier titles. Usually, in an Atelier title, it is fun to know a little bit about a character from encountering them in a previous game and knowing things that the characters in the game don’t necessarily know right away. In Atelier Totori’s case, I think it would have been even more fun not knowing about Pamela’s spiritual nature and finding it out at the same time Totori did. Mind you, it was still a fun series of scenes even with that knowledge. The characters were all nicely detailed in terms of their outfits and general looks. As an example, Marc the eccentric professor… I’m sorry I mean “The Exceedingly Exceptional Genius Super Scientist Professor McBrine” has an oil spotted lab coat on due to all the tinkering he does with machines. The fact they bothered to add the oil/dirt spots just shows the attention to detail they used when designing the character models. The weapon models are also very detailed and change in appearance when a different weapon is equipped. It would have been nice if their armors also changed their appearance, but that would have invalidated the dressing room feature for Totori. The interactions between characters feel natural and not forced for the most part. Some of the conversations do seem a little contrived but that can be forgiven as after all it was meant for entertainment value. In general, the game looks quite nice. They really went all out with the nautical theme since Totori is from the small fishing village of Alanya rather than Arland itself. The text boxes look a bit rustic, nameplates are stitched on and a little fish shows you when you need to press a button. Each of the areas you visit, for the most part, looks different rather than just being recycled. Sure, some share the same overarching theme, but the area itself is still laid out differently. The map screen is a bit dull to look at, but it serves its purpose and being overly cluttered would serve as more of a hindrance and distraction rather than functional like it is. Every time a new area is added a gold circle is located in front of it to tell you that you have not been there yet, and once you have visited it the circle turns white. The preview menu will tell you anything you already know about the area, which can help you hunt down materials you are looking for. The controls of the game work well most of the time. For some odd reason, and this could have been my system at fault, if it was the first time I launched the game that day, the controls would sometimes be button mapped incorrectly to my gamepad. Here is the interesting thing though, I left the controls as default. 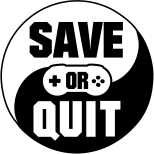 Closing the game and reopening it would revert the controls back to normal. It never happened with Atelier Rorona so I am not quite sure what is going on there. Ignoring that little quirk, the controls seemed to be laid out in an effective way. The user interface updates, especially those involving inventory control, took a while to get used to, but for the most part, they worked well too. In Rorona you could search and sort your container/basket easily. In Atelier Totori it didn’t seem to have the same filter/sort options but did have a more powerful search tool for you instead. I can’t really say which I liked better. If you happened to know item classifications really well, you could definitely make use of the search tool more effectively. I kind of liked the way it was done in Atelier Rorona better, but it could have just been because I was more used to that system at the time and Atelier Totori’s system seemed to be convoluted at first. Ultimately, if I could have the sorting features available to Rorona and Totori’s filter system, I think that would be the most effective way of flipping through your hundreds of component items. Another thing that I liked better about Rorona’s system is that if you made key items, you could just sit them around Rorona’s Workshop and gain their effect. Totori though had to carry them with her to utilize their functions. That does make way more sense in reality, but it wastes precious basket room and adds clutter while trying to find things in your inventory. This game, like Atelier Rorona, has multiple endings. While it doesn’t appear to have as many as Atelier Rorona does, it still has quite a few. When talking about endings in games in general, the true ending is likely the one the next game will be based on, so it is generally a good idea to try to get that particular ending although any of the non-specialized endings likely will set you up for the next game properly. The true ending can be quite demanding, and while it is possible to view all endings in a single play-through with a little creative saving, it isn’t exactly intended for you to do that. I have to say the true ending of this game is very heartwarming in comparison to the normal, but still fitting ending. 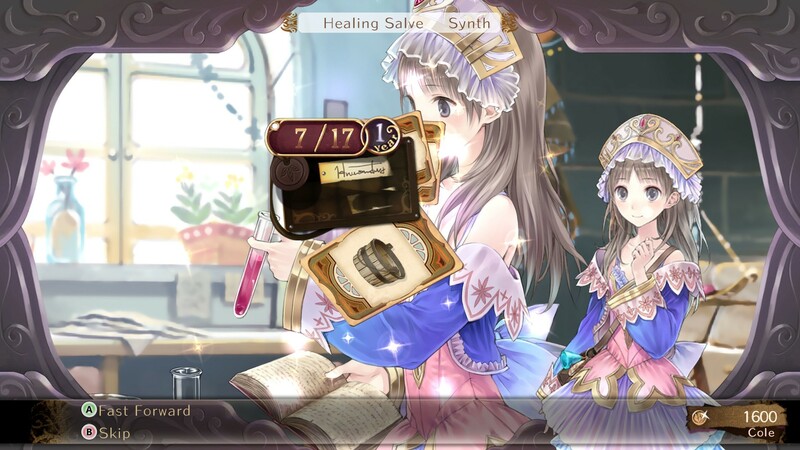 So, should you get Atelier Totori: The Adventurer of Arland? While playing Atelier Rorona first is likely better just because it introduces key characters, it really isn’t necessary to start with it. You could easily start with Atelier Totori and have a good experience. It will even make the Pamela scenes near the end even more fun for you if you have never played another Atelier game. 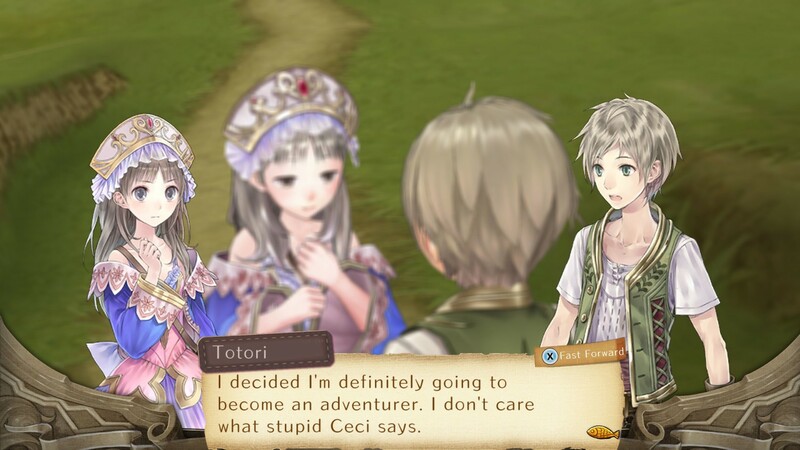 If you are looking for a straight forward and decently laid-back game, then Atelier Totori will likely be for you. The combat is easier but still robust enough to keep it interesting, and the alchemy is simple. It features a save either on the world map or in the diary feature that Atelier Rorona lacked, which makes it much easier to play in shorter sessions. In Atelier Rorona you might burn through two precious weeks just to go save, whereas in Atelier Totori you will not be forced to waste any time unless you exit an area prematurely to do so. Atelier Totori is divergent enough from Atelier Rorona that it does feel like a different game and not just more of the same (not that there would be anything wrong with that!). 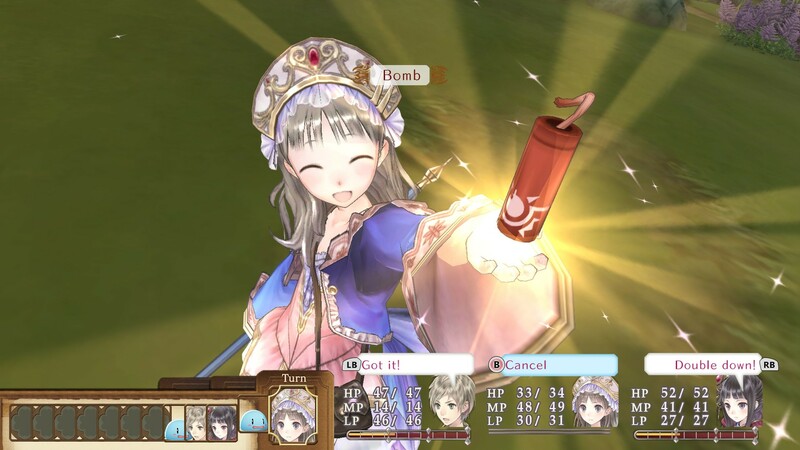 All in all, Atelier Totori: The Adventurer of Arland is worth playing if you are a fan of the Atelier series or if you want to sample an Atelier title to see what a game in that series is like without needing to worry about the missed backstory. My only problem with this game is now I can’t wait to start the next one.